Class Size: Michael wants to limit the number of attendees for a higher quality experience, and therefore is limiting each workshop to 6-8 Total Attendees (Note: we have already filled some of the available seats). Who is this workshop For: Intermediate to Advanced Photographers – It is expected attendees will have at least a basic knowledge of photography, their camera, lenses and either Lightroom and or Photoshop. Michael prefers to work in Photoshop and will be demonstrating editing examples in PS. If you are a pure beginner, Michael has many downloadable courses that will get you up to speed in no time. We discourage pure beginners from attending this course unprepared, as it will be designed for more advanced, hands-on shooting situations. Enrollees will be given a $500 training & accessories bundle (See Below), including a crash course for your camera if you don’t already have one. Goals & Aim: While many larger workshops are limited to watching an instructor shoot, Michaels wants this to be about the attendees’ skill sets. Each session includes basic instruction after which students apply and demonstrate the required skillsets. 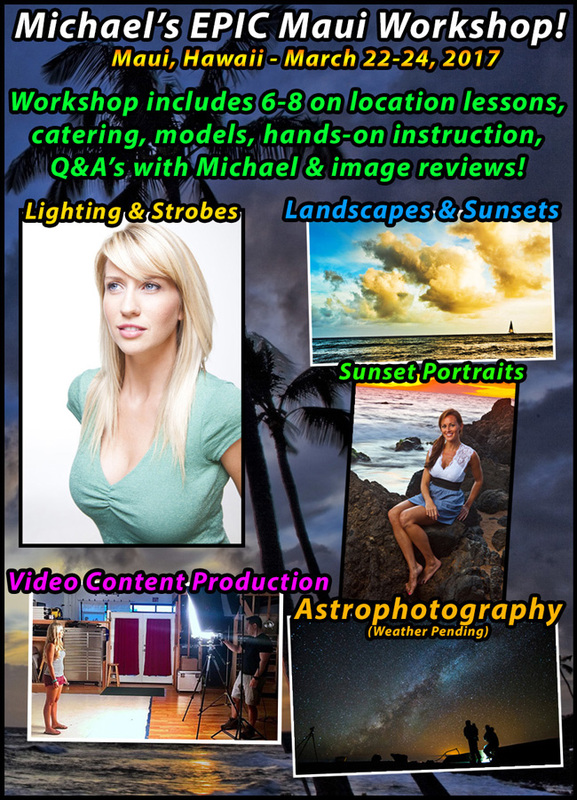 The workshop is designed for attendees to get hands-on practice for various advanced techniques including Landscapes (specifically sunsets), Portraits (both natural and artificial light), Studio Lighting (including Michael’s new cutting edge technique) Astrophotography* (*weather permitting), and various video production skill sets. 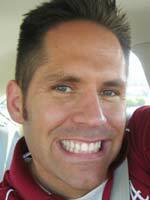 -	A once in a lifetime, 2-day, epic workshop opportunity with Michael The Maven. The workshop includes 6-8 On-Location Crash Courses on various shooting topics & styles (see schedule below). Michael will literally be there standing over your shoulder helping you to own these skill sets. -	Beach House Access during the day for all attendees. -	While it is better to bring your own tripod, Michael will have a few extras to loan out. Where To Stay: We have a limited number (5) of rooms available at the beach house during the workshop days, which we are offering for an additional $250 a night, and is going to be less expensive than most local hotels. We expect these rooms to fill quickly. There are hotels and Airbnb rentals in the nearby area. The beach house is very close to Times Supermarket in Kihei: 1310 S Kihei Rd, Kihei, Hi 96753. How to reserve your spot: Contact Michael’s Assistant Kate to reserve your spot: support@michaelthemaven.com - or call: 586-945-5870. A $500, non-refundable deposit reserves your spot for the workshop. If you are staying at the beach house, a $250 non-refundable deposit reserves your room. The balance will be due 30 days before the workshop, or Feb 20 2017. Attendees who do not complete the balance at that time, will forfeit their spot and deposit. -	Your camera, preferably a DSLR or Mirrorless Camera, with back up batteries and memory. -	Bring warm clothing including a jacket and hat. Beach shoes. -	Wide-angle, normal zoom and telephoto zoom lenses. While a wide-angle prime of 2.8 or wider is desirable for astrophotography, it is not required. -	Cokin P Filter holder, with thread adapters for each of your lenses. -	You of course and an open mind with a positive attitude! Do I need a rental Car? Yes. Unfortunately, Michael will not be able to arrange for a driver to and from the airport, beach house, locations or the studio. Having your own rental car will also give you greater flexibility in your stay. What about Astrophotography? Some of you have asked about the astrophotography lesson. Much of this will depend on weather & astral conditions, and therefore, we cannot say for sure if it will happen. If a good conditions present themselves, it will be discussed with the attendees and make the decision at the time. We honestly hope this is possible, but unfortunately cannot control cloud conditions, and therefore cannot make this commitment. If we can make it happen, we will. Can I bring alcoholic beverages to drink or smoke at the beach house? We respectfully ask that no alcoholic beverages consumed when staying at the beach house, as many of the other attendees do not drink. Smoking is not allowed. Thank you. Can I bring my Spouse to stay at the beach house, even if they are not attending the workshop? Check with us, as this is probably doable, but will depend on the number of people we have staying at the beach house. Can I rent rooms at the beach house if I decide to stay longer than the workshop dates? Unfortunately we want to have these rooms available for as many attendees as possible, so we are making them primarily available for attendees. How long should I stay? It is likely Michael will be doing some fun activities on the 25-27th if you decide to stick around. Whales are in the area at this time of year, Michael will also be going to the Bamboo Forrest & Hana on the 26th or 27th. These activities would be purely social and not related to any lessons or classes, but the photography opportunities will be spectacular. If I make money with my photography, can I write this workshop off? Technically, if photography is part of your main business, yes, the entire workshop should be tax deductible, including airfare. If your photography is a hobby only, you will not be able to. Please consult with a tax professional if you are unsure about your business status. * All of this information is subject to change and updates in order to accommodate the best experience for attendees. We also reserve the right to deny attendance to any student on the condition of offering a full refund.